EP 116: Ronald’s one way ticket is back to 1760s London to join this American Founding Father. Ronald Blumer has written, produced, or co-produced eighty documentary films, including three series with Bill Moyers: “Creativity”, “A Walk Through the Twentieth Century” and “The U.S. Constitution”. For PBS, he has written & co-produced the six-part series, “Liberty! The American Revolution”, a three-part mini-series on the life of “Benjamin Franklin” and “American Photography, A Century of Images”. He also co-wrote an episode of Ric Burns’ “New York”. His script for the National Film Board’s “Paperland, The Bureaucrat Observed”, won the Canadian Film Academy’s award for best non-fiction script. He wrote treatments for a six-hour dramatic series on the life of Prime Minister Mackenzie King for the Canadian Broadcasting Corporation and for PBS’ four-hour special on the life of Lyndon Johnson. He worked on the design and scripted interactive exhibits for the new National Constitution Center in Philadelphia, as well as interactive exhibits for “Benjamin Franklin: In Search of a Better World” now touring the country, and a video on the history of the First Amendment for the Newseum which opened in Washington, D.C. in 2008. Blumer wrote a NOVA episode on the re-encasement of the founding documents (a short version is currently showing at the National Archives in Washington). He wrote a film on the Mariinsky opera & ballet, “The Sacred Stage”, which premiered at the Kennedy Center. In 2006, he wrote the two-part PBS series “The New Medicine”. 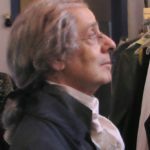 His two-hour PBS program on the life of Alexander Hamilton was nominated for a Writer’s Guild in 2008, as was his work “Dolley Madison” in 2011. A U.S. citizen born in Montreal, Canada, Blumer received a Bachelor of Science from McGill University, a Master’s degree in Film Production from Boston University and was in the Ph.D. Communications program at McGill University where he was John Grierson’s assistant (Grierson coined the word “documentary” film). His articles have been anthologized in various books and publications including film program notes for the Museum of Modern Art. He has written a book on the film director Donald Brittain, and co-authored the companion book to The New Medicine. Blumer has taught documentary film research and writing at New York University’s Film School. In recent years, he has been invited as a guest speaker at the History Departments of Yale University and Princeton University, the film schools of York University in Toronto, The New School in New York and the University of North Texas, Dallas/Fort Worth. He also gave presentations at the American Revolution Round Table, the New York Chapter of the Daughters of the American Revolution and the New York Bar Association.